Metalphoto photosensitive anodized aluminum is proven to withstand multiple sterilization cycles and not fade or harbor bacteria as per ANSI/AAMI ST79 steam sterilization and sterility assurance. Why Identify Medical Devices and Hospital Procedures? Healthcare providers label and identify property and processes in order to keep track of inventory, communicate hospital procedures and manage recalls. Items that must undergo sterilization or other cleaning procedures are especially difficult to label. The sterilization process can degrade plastic or printed materials, rendering these labels and signs illegible. 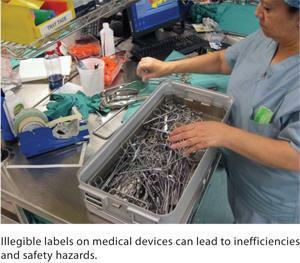 The cost of illegible labels is greater for medical devices and sterilization containers, where the inability to survive the sterilization process can lead to lost inventory and medical errors. 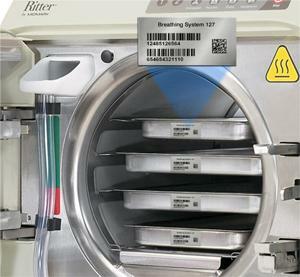 To address this issue, the FDA announced its proposed regulatory language for a Unique Device Identification (UDI) system that would require all devices used by a hospital or medical office to be identified with an Automatic Identificaiton and Data Capture (AIDC) technology such as a barcode label. Metalphoto photosensitive anodized aluminum was recently tested to ANSI/AAMI ST79 steam sterilization and sterility assurance standards in response to the need for durable, permanent labels and signs that can last in a healthcare environment. 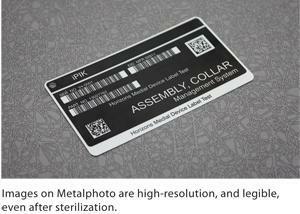 Why Metalphoto for Medical/Surgical Device and Procedure Identification? Metalphoto photosensitive anodized aluminum - long known to be one of the most durable materials for military and industrial labels and data plates, was recently proven to withstand multiple sterilization cycles and not harbor bacteria as per AAMI ST79 steam sterilization and sterility assurance standards. The testing was conducted by Pacific BioLabs, a leader in sterilization testing and certification. 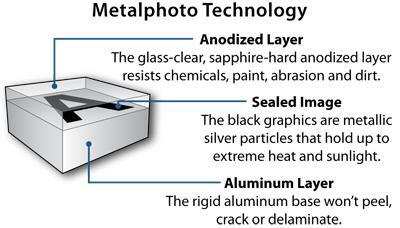 Metalphoto is a technology that embeds an inorganic, silver-halide photographic image inside of anodized aluminum. The Metalphoto image is resistant to temperatures up to 1,200°F, abrasion and chemical exposure. It will not fade, corrode or harbor bacteria after repeated sterilization cycles. Because the Metalphoto image is photographic, it allows the detail and constrast required for all barcode symbologies, including those required of UDI, at any size specified. The Association for the Advancement of Medical Instrumentation (AAMI) published ST79 — the comprehensive guide to steam sterilization and sterility assurance in health care facilities in 2012. ST79 consolidates five AAMI steam sterilization standards into a single comprehensive guideine for all steam sterilization activities in healthcare facilities. The FDA requires all medical devices that must be sterilized to be validated to ST79 — Metalphoto now joins the list of materials tested to ST79 sterilization. The certification test performed by Pacific BioLabs consists of infecting a set of Metalphoto samples with beobacillus stearothermophilus, a bacterium known to resist moist heat sterilization. After a single two minute sterilization cycle, all twelve Metalphoto test samples were inoculated — validating that the Metalphoto surface can both survive the sterilization process and not harbor bacteria. The complete report is available for download here. Metalphoto is used in medical and surgical applications where plastic labels break down and screen printed anodized aluminum will fade after multiple sterilization cycles — exposing patients, hospitals and physicians to inefficiencies, frustrations and health risks. Metalphoto is used for permanent medical/surgical device and procedure identification applications such as asset identification/UDI barcode labels, procedure identification/communication signs, sterilization container labels and systems, surgical device control panels and several others. For over 50 years, industrial and military engineers have specified Metalphoto photosensitive anodized aluminum in applications where permanent product identification is critical. Metalphoto's proprietary technology permanently seals a UV-stable image inside of anodized aluminum, offering the confidence of unparalleled durability, image resolution and readability. Metalphoto is used for component labels, machine nameplates, barcode labels, operator control panels, maintenance schematics, architectural signage and many more applications where permanent identification is critical. Metalphoto is produced by Horizons Imaging Systems Group, an internationally recognized manufacturer of printable aluminum technologies. Employing a range of processes, the company's state-of-the-art manufacturing lines are located in Cleveland, Ohio, USA. For more information, visit www.horizonsisg.com. Pacific BioLabs is a contract research organization (CRO) offering testing and research support services primarily focused on supporting the pharmaceutical, biotech, and medical device industries. Specializing in the biological sciences, PBL is committed to helping its clients deilver lifesaving medicines and medical devices to physicians and patients who need them. For more information, visit www.pacificbiolabs.com.